I’ve been back at the Megalo print studio in the past two weeks. I’ve stuck to my ‘just experiment / play strategy’ here are some of my results. The first three prints are A4 size. The last is A3 size. 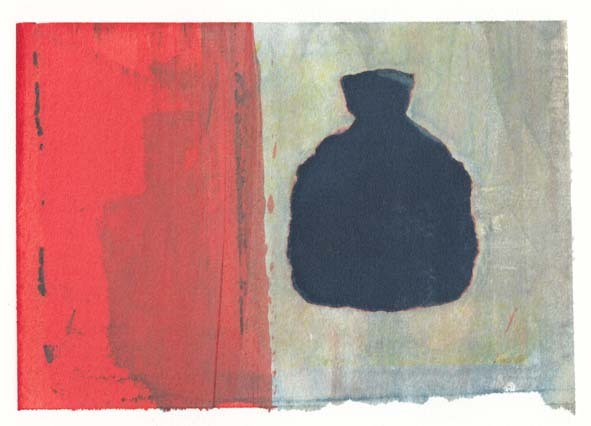 Dye screen print, 21 August 2013. Dye screen print, 21 August 2103. Today I made these prints. 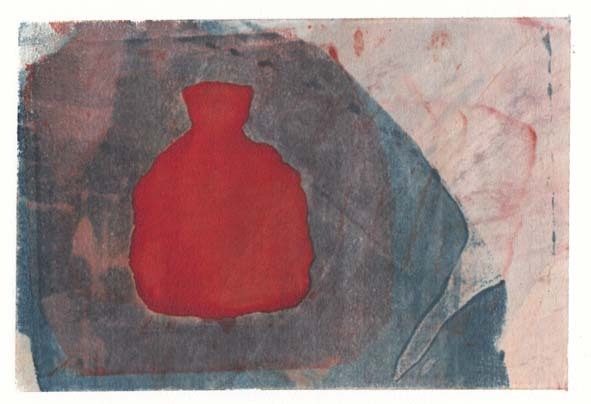 Dye screen print, 28 August 2013. 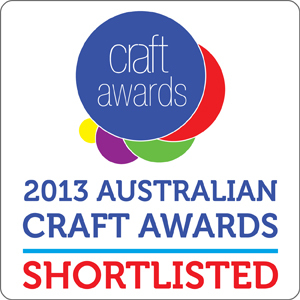 I recently submitted an entry into the Australian Craft Awards 2013 and have just been advised that I have been shortlisted for the awards. You can see my entry here. Finalist and category winners in the 2013 Awards are determined by a combination of a judging panel, industry and marketplace votes – by the average score across all three respective votes. The marketplace is basically anyone who is interested enough to vote for the work, so if you feel inclined please drop by my entry and vote. Meanwhile I’m going back to working on my newest piece. 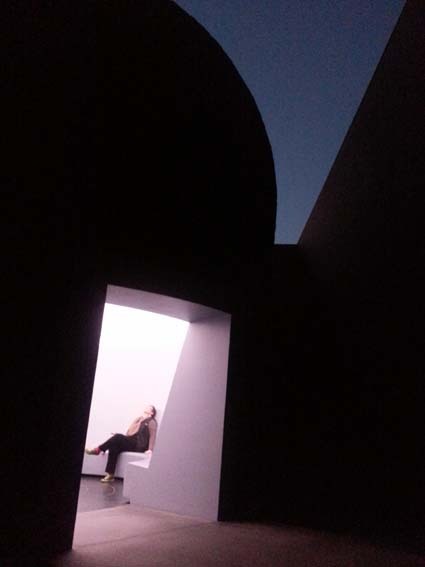 One of the highlights of the renovation of the National Gallery of Australia a few years back was the installation of a major artwork by James Turrell called Within Without. If you are familiar with his work you will know that he likes to use light and optical illusions in his space/sculptural works. In this case a domed room has been enclosed inside a truncated pyramid, with both the pyramid and room open to the sky (if you follow the link you can get a sense of the space). It’s a nice space to sit in during the day, but at dawn and dusk there is a special lightshow that really makes the work quite magical. If you live in Canberra, or visiting, I would highly recommend that you experience this amazing artwork. Experiencing Within Without at the National Gallery of Australia. After the last day of the watercolour workshop we were just there at the right time to see the lightshow. I was amazed and hope you will be too. Just remember that the ‘circle’ you see in the following series of images is a hole in the roof of the building. The colour surrounding the hole is projected onto the rooms white walls. The apparent colour changes of the ‘circle’ are in fact an optical illusion. These images were taken over a period of 40 minutes using my camera phone (much better than my old pocket digital camera!). 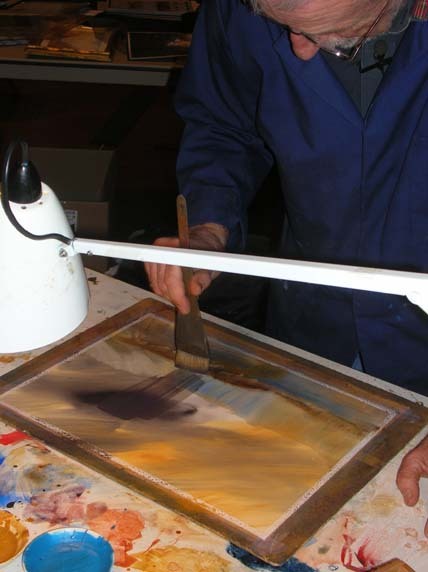 How Turner, the brilliant colourist, would be working if he was alive today was discussed during our workshop. I think he might have been working like James Turrell. 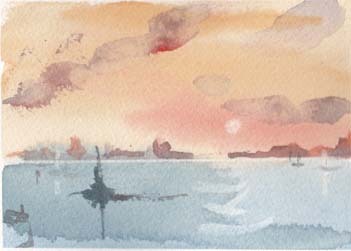 At the Turner watercolour workshop Toni urged us to keep practising what we had learned to embed it into our skill set. So I’ve been working away on pages of small works. I also painted two views of Mt Tennant experimenting with warm and cool compositions and some lifting techniques. Then I tried some imagined landscapes and weather effects, with varying degrees of success. Day 2 took off at a similar pace to the first day of the class. Toni started by walking us through some ways of making sketches. According to Turner’s contemporaries Turner carried a rolled up sketchbook in his pocket and drew with his pencil as if writing. By leaving the pencil on the surface of the paper the pencil moves easily over the paper and delicate lines can be drawn, which may readily be painted over later. You can draw this way quite quickly and if you have the time additional detail can be added. Another method, even quicker still, is to do a ‘thumbnail’ sketch just getting the most basic shapes in, using the lightest tones at the back and darkest tones at the front. Here is my sample of these two approaches. 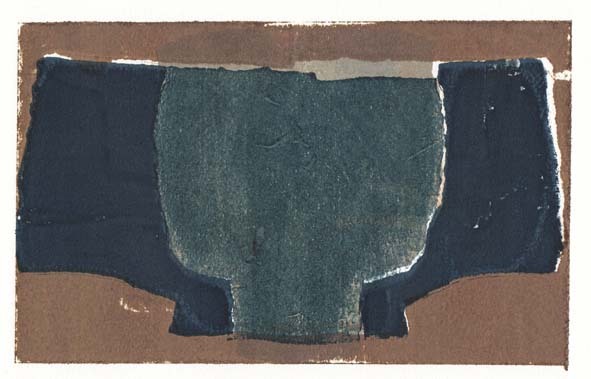 The top sketch formed the idea for the first colour work below. Two sketching techniques. The top a pencil moves quickly and lightly over the surface. 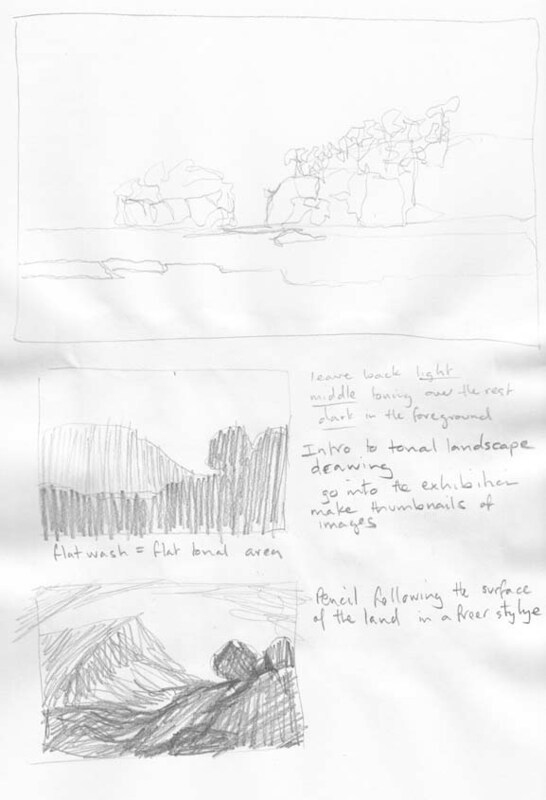 The lower two are fast thumbnail sketches. 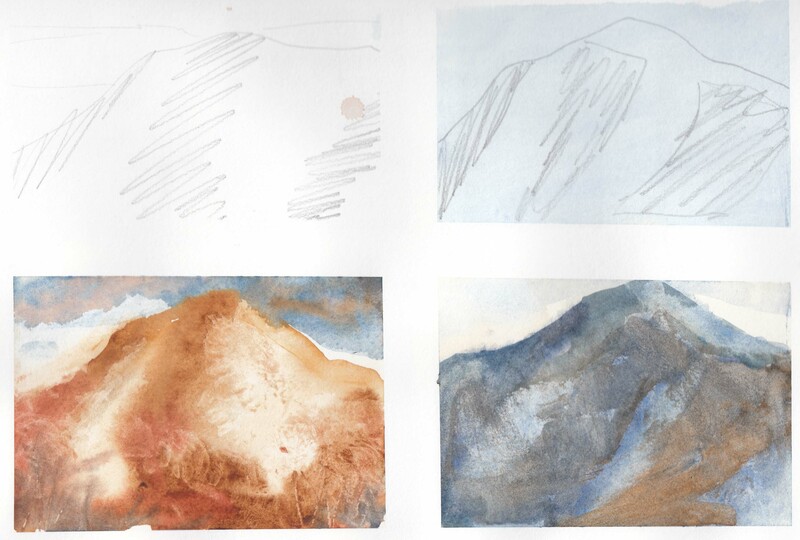 Turner was able to do 10 to 15 sketches in the time he could do one colour study. If you look at Turner’s sketchbooks you can see the numerous quick sketches that he he made while traveling by carriage through Europe. 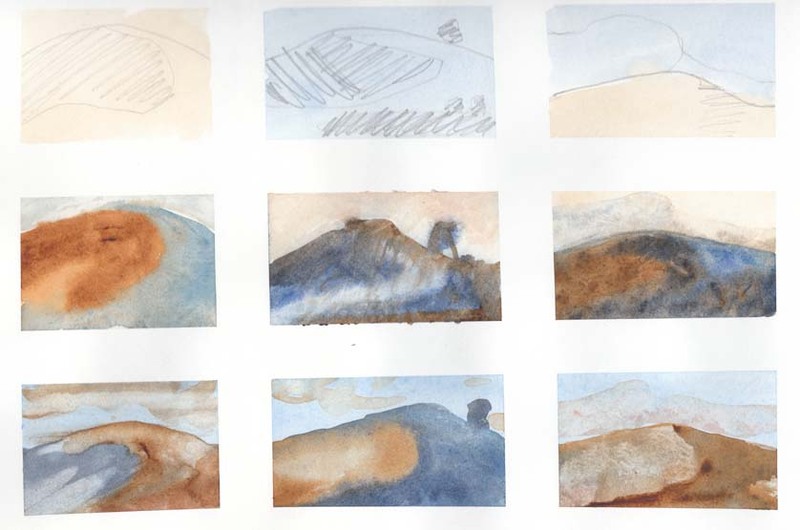 Once he was settled into his overnight accommodation Turner could then add colour to these studies or further work up his sketches or colour studies. 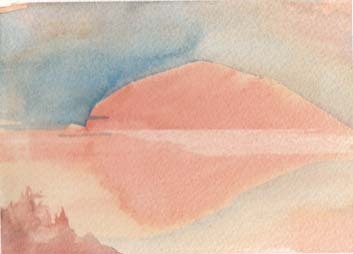 Toni then demonstrated how to use normal cartridge paper for watercolour studies without having to tape the paper down. The way you do this is to wet both sides of your cartridge paper and place it on a smooth surface, such as a piece of glass or plastic and then the cohesion of the water molecules will hold it in place. Of course you do need to work wet into wet using this approach. Cartridge paper wet of wet technique. The darker lines are made using the end of my brush and the ‘lifted’ area in the upper right is made by flicking my fingernail up the wet paint. I was really happy with this as a way of doing quick studies. Here is another one. The main drawback with using cartridge paper is that you are pretty limited with the sort of ‘lifting’ techniques you can use. Wiping with a tissue works, but the creating the sun in the image above actually tore into the paper. After lunch we had a lecture by Dr Joyce Townsend on Turner’s materials. 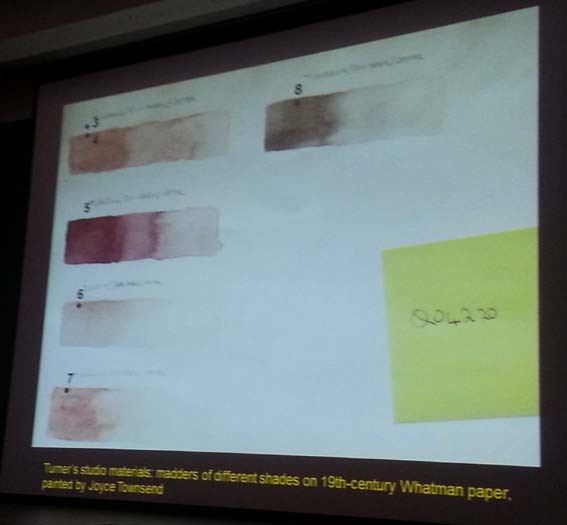 I think that the most amazing aspect of her talk was her obvious delight at being able to actually use Turner’s original pigments, that were left in his studio at his death (part of the Turner Bequest), to paint samples demonstrating the colours he used. 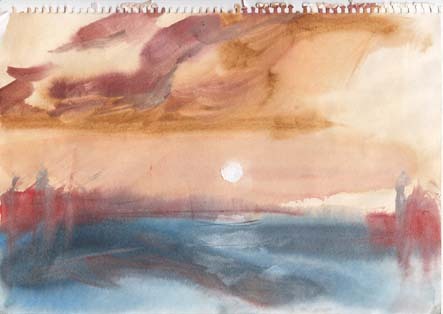 Turner’s studio materials: madders of different shades, on 19th century Whatman paper, painted by Joyce Townsend. It was then up to us to bring together what we had learned to develop a final work on BFK Rives paper. 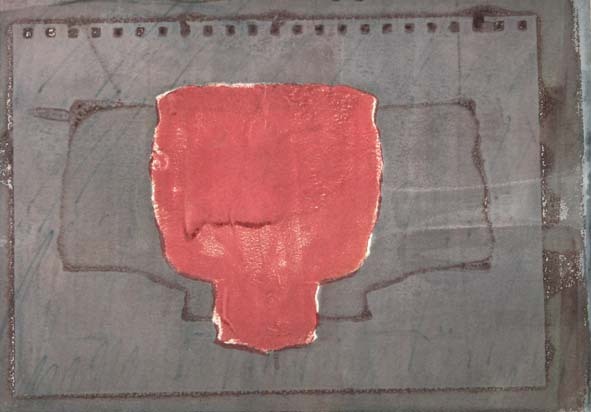 While this paper is made as a printmaking paper Toni said he had found it to be the best paper to allow working, re-working and lifting techniques including scraping with a knife. Here is my final piece. From my perspective, the quick sketching and fast ways to work up colour studies are the main things I have taken from this workshop. That and the need to get out and apply what I’ve learned over these two days. 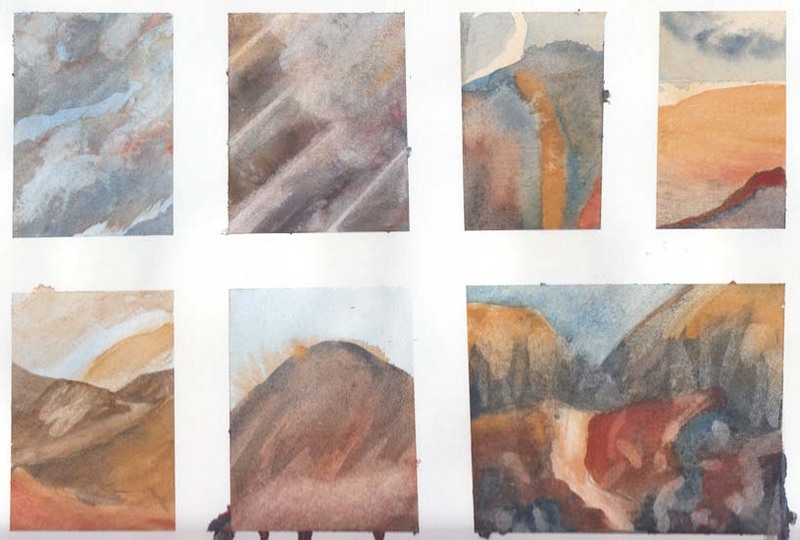 I’ve had a wonderful two days this week doing a watercolour workshop at the National Gallery of Australia on JMW Turner – learning from the master. The course was held as part of the Turner from the Tate exhibition. Our tutor was Toni Smibert, who is a Tate Gallery Visiting Artistic Researcher. 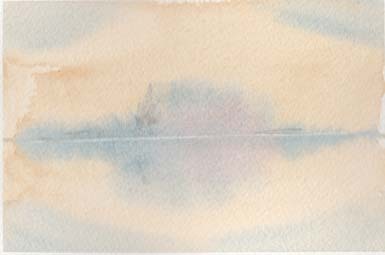 Toni’s area of interest is watercolours and he has worked closely over the years with Dr Joyce Townsend who is the leading specialist on Turner’s materials (paint, paper, tools etc). We set off at a fast pace as Toni discussed and demonstrated the methods that Turner used. 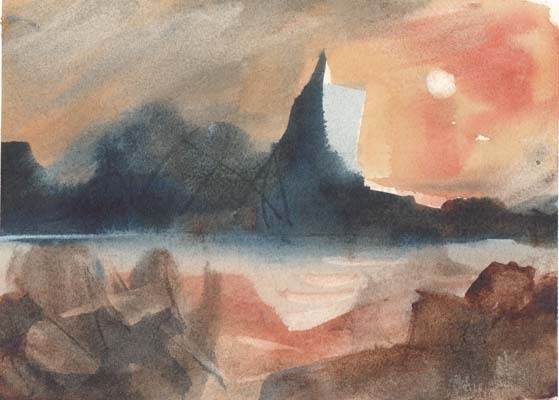 Turner’s work uses many basic concepts, such as the relationship between warm and cool colours and light and dark contrast. We worked on small areas, dividing up sheets of Arches watercolour paper, to record methods and processes. Toni suggests repeating these exercises, making many small works so these techniques become ingrained. This is not so you develop slavish copying but to help you get to the point where you can intuitively use the techniques as and when it applies to your own work. Like Toni said doing the exercise once won’t teach you the method. 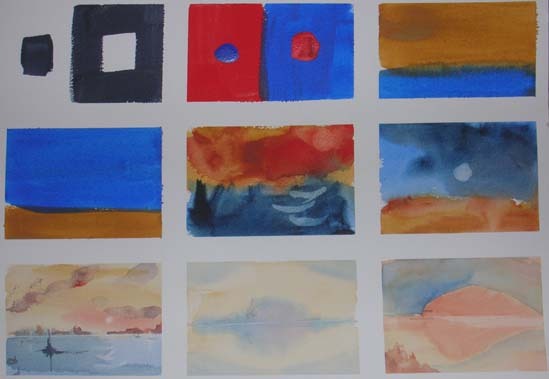 Simple design structures such as a washes of warm colour above a wash of cool colour, suggesting sky over water, or the reverse suggesting sky over land were explored. With a bit of guidance we were able to readily produce a convincing waterscape. 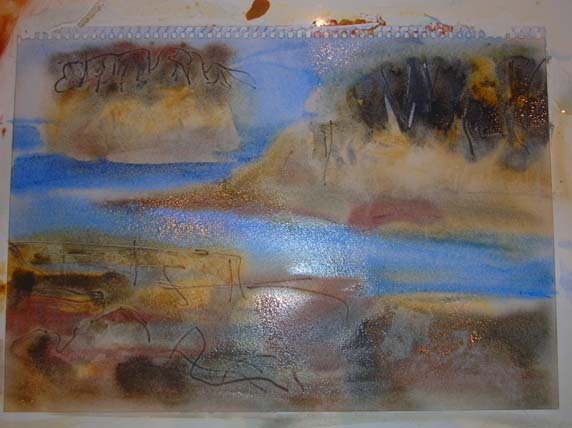 A waterscape using a warm wash above a cool wash.
and warm colours into a cool background to develop landscapes. This flows from another method which is ‘finding the landscape’ in the paint. Basic structures can be worked and re-worked to develop a final image. It was a very full day. At the end of our class we went into the exhibition so Toni could show us some specific examples of Turner’s techniques and demonstrate some approaches to doing quick sketches. What a luxury to have the originals to study so closely.